Yes because he switched to fresh tyres 8 laps later when you have lower fuel. Would love to see the face of those (who want Vettel to leave Ferrari as soon as possibe) when Seb is on pole tomorrow. In overcut mode, it could easily have been engine modes which make a big difference at Monza. We have a superb car, we simply need to cut out on mistakes and the title is ours. Kimi Raikkonen has been caught speeding in the pitlane - 73.1 km/h. Decision The competitor (Scuderia Ferrari) is fined €1000. If I was error free and got the fastest lap in FP3 and not to mention ice cream in this hot and humid environment , I would speed in the pit lane and cost my boss at least some money but nothing compared to what my team-mate did. It will be interesting to see how Bottas approaches the race on Sunday. Will he be trying to win, or backing into a Ferrari? 1.6 seconds between the HYPERSOFT and ULTRASOFT tyres. Nope. But glad to see that you got the gist again. These small mistakes that he's been making constantly over the weekends are indicators of him losing this battle inside his head. Just like he said yesterday: He is the biggest enemy of himself. I think Karun mentioned on C4 today that although a street circuit like Monaco, there is more of a straight here, which suggests engine power is more relevant. If true, that's bad news for RBR. 50 minutes less practice really won't change much this weekend. RBR are not really a threat to us or Merc for the rest of this season. They are too far behind now in engine and aero. as if i'd wish any of our drivers to lose the WDC!!! Not even if they cursed while driving let alone to compare them with an ex driver of ours. wth! Yep. These mistakes go unnoticed for most of the drivers bcz they have zero effect on the outcome of the WDC. Oh yeah and they are not world champions for a reason. Not driving for Ferrari for a reason. Hamilton makes mistakes as well, yet, somehow, he still manages not to step over the limit. Which is not true to Sebastian. I want him to win more than anything, but he does not seem to be deserving it. People who want Vettel to lose the championship just to 'prove' something are not true Ferrari fans. Go somewhere else. It's a small mistake either way, he clipped the wall and lost 50 minutes of race sim track time, which Kimi done anyway so no big deal IMO. It's not like he is the only one to make a small mistake. Red Bull are overrated. They don't have the downforce to match either Ferrari/Mercedes here. 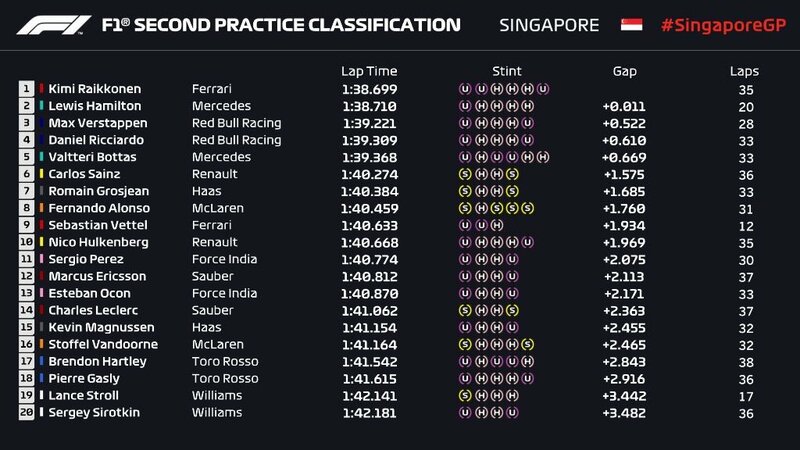 I like how Horner keeps crying about Renault engine, but the fact is, they were nowhere near Ferrari in Hungary and they are nowhere near Ferrari/Mercedes in Singapore. Rule #1 in this Forum: NEVER try to imply that Kimi might be doing something good. Yes, I know. Learned that hard way.